IN IRISH FISHING vessel has been detained by the Naval Service for an alleged breach of fishing regulations. The ship was detained yesterday afternoon 80 nautical miles off the west coast of Ireland. 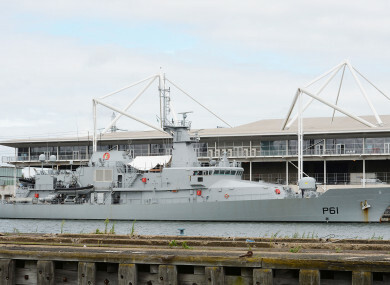 It was escorted by the LÉ Samuel Beckett to Galway, where it arrived this morning. There it was handed over to An Garda­ Sí­ochána. This is the first vessel detained by the Naval Service in 2019. Last year the Naval Service fleet conducted approximately 740 boarding operations and detained seven vessels for alleged infringements of fishing regulations in support of the Sea Fisheries Protection Authority. Email “Irish fishing vessel detained by Naval Service off west coast ”. Feedback on “Irish fishing vessel detained by Naval Service off west coast ”.